The street food scene in Saigon permeates every district, neighbourhood, and alleyway; the city boasts so many street food outlets that, at times, Saigon feels like one gigantic, open-air restaurant. Every day, thousands of street-side eateries offer up delicious, cheap food in an informal environment on the city’s sidewalks. 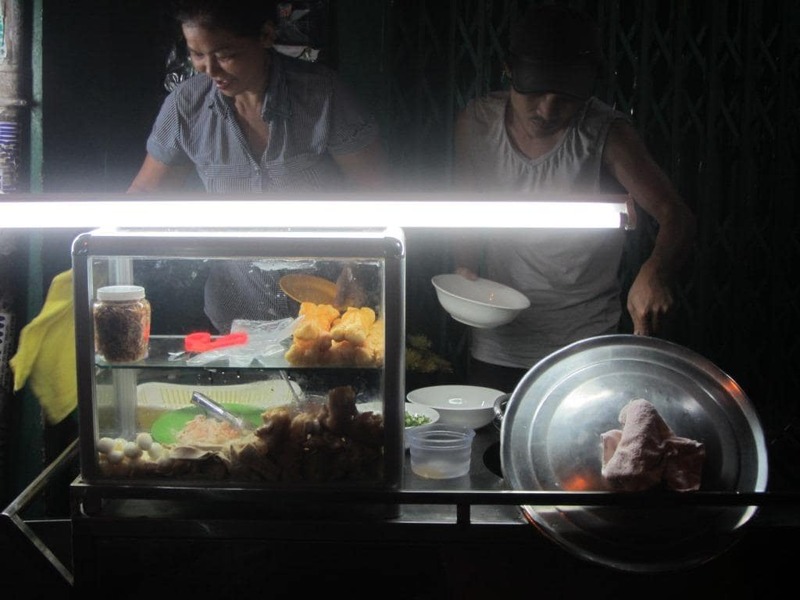 But street food is about more than food: it’s about atmosphere and ambience. As a friend of mine once pointed out, if you take street food home with you, it doesn’t taste anywhere near as good. Eating street food is without doubt the best thing to do in Saigon. Here are my 7 favourite streets for street food in Saigon. Even in the light drizzle of a cool rainy season evening Van Kiep Street is a thrilling exhibition of Vietnamese street food. Showcasing dozens of different dishes all in the space of a couple hundred metres, Vạn Kiếp Street straddles the border of two of Saigon’s most vibrant districts, Phu Nhuan and Binh Thanh. Neon signs prick the night, illuminating the slanting rain as they announce the specialities of each food and drink outlet: phở, bánh canh cua, bánh mì, bánh xèo, bún mắm, bún bò Huế, bún chả, nem nướng, chè – there must be at least fifty different dishes available on this street, and over a hundred eateries to choose from. The street is packed with young Vietnamese – I rarely see any customers over the age of 30 – all clustered around small plastic tables, hunched over on small plastic stools, talking, eating, gesticulating, laughing. Quán 104 (230 Van Kiep) is a small, trendy place specializing in grilled octopus (bạch tuộc nướng), which is very popular with Saigon youth at the moment. The spicy, marinated octopus is grilled over a coal barbecue on the sidewalk; the scented smoke wafts into the street, enticing all who pass to stop and eat, like a vaporous Siren. Van Kiep has more than its fair share of bánh canh cua outlets – a stodgy, slippery, fishy, noodley southern classic: try it at 63 Van Kiep. Near the intersection with Phan Xich Long Street there are a couple of good bún mắm stalls. This is a potent seafood noodle soup which is crammed full of wholesome ingredients (read more about it HERE). Sư Vạn Hạnh is a long, lively street in general, but the section between Ngô Gia Tự and Nguyễn Chí Thanh streets is partiuclarly frenetic and jam-packed with excellent street food. When I lived just up the road from here, my housemates and I referred to it as ‘The Ghetto’, because the area is dominated by several run-down, Soviet-style apartment blocks. Because there are so many people living so closely together in this neighbourhood (and because conditions are so cramped inside that people would rather spend their time outside), the area’s street-life is exceptionally vibrant. Food stalls, vendors, casual eateries, cafes and bars line the street, all in the shadow of the dilapidated apartment complex. Young and old, families and couples take their seats on plastic stools at metallic tables and tuck into the various street treats on offer. The contrast between the energy and colour of the street food scene and the grey, grim, concrete bleakness of the apartment buildings (some of which are now in a state of demolition) is extreme and compelling. This street’s speciality is bánh xèo (savoury crepes filled with pork and bean sprouts). 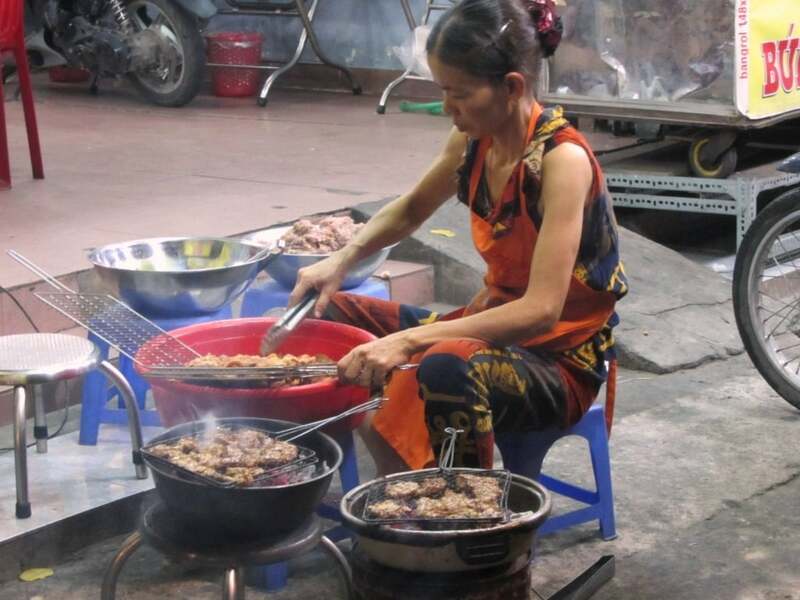 Dozens of places serve small bánh xèo cooked on circular trays over flaming, coal-fired barbecues. My favourite is at 004 Lô H (literally ‘Block H’), where the family have been in the bánh xèo business on the same spot for 14 years. At the corner with Hòa Hảo Street there’s a good Chinese-style noodle outlet called Tai Phát. Try the mì vịt tiềm (egg noodles with duck in a deeply aromatic broth). The noodles are sold from a classic xe mì (noodle trolley) decorated with painted dragons and scenes from Chinese mythology. Right at the southern end of Block H (Lô H) there’s an outstanding Vietnamese dessert stall on the corner. This place is rammed with young Vietnamese who gather around the tiny tables in groups to enjoy any of the sixteen different kinds of dessert sold here. All of them are gooey, sweet, colourful and involve sticky rice, green bean or coconut milk in some form or another. The textures and flavours might be unfamiliar to most foreign palates but the sheer variety and youthful energy of this stall make it my favourite place on this street (read more about it HERE). 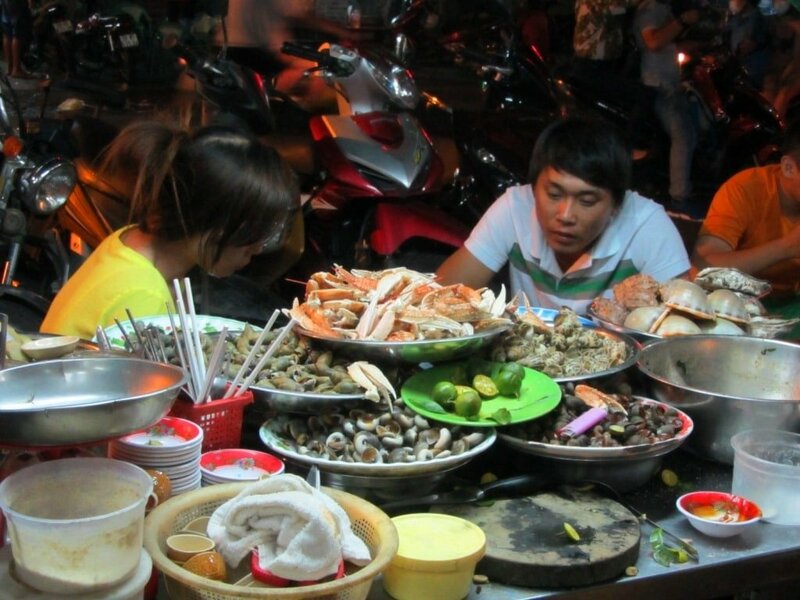 Apparently one of the favourite haunts of the notorious Vietnamese gangster Năm Cam (executed in 2004), today Vĩnh Khánh Street is one of the most popular places for street food in Saigon, especially seafood. Every night young people throng the sidewalks sporting trendy hairdos, tattoos, and the latest fashions from South Korea – you rarely see anyone over the age of 25 here. The atmosphere is electric: hundreds of small and large groups of friends hunker down at tiny red and blue plastic tables, splitting shells, cracking crab legs, clinking beer glasses and having a really good time. As if the thundering cacophony of laughter, traffic, and orders being shouted wasn’t enough, some enterprising teenagers pull up on the curbside with giant amplifiers strapped to the backs of their motorbikes and proceed to blast out karaoke for the ‘entertainment’ of all street food customers. There are fire eaters and street dancers too. To say that the food scene here is vibrant is an understatement: it’s choatic, loud, busy, oppressive, unrelenting and a glorious celebration of food, fun and youth. 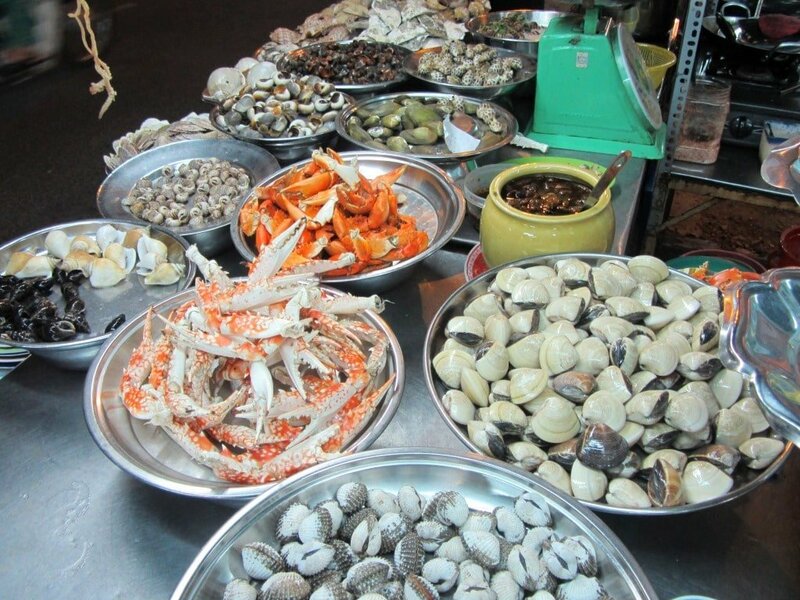 Head to Ốc Oanh (534 Vĩnh Khánh Street) for seafood and shellfish. This is the most famous of all the seafood joints on the street. In Vietnam fame often leads to apathy and a decline in quality, but this is not the case at Ốc Oanh where the portions are big, the seafood fresh, and the service brisk and efficient. 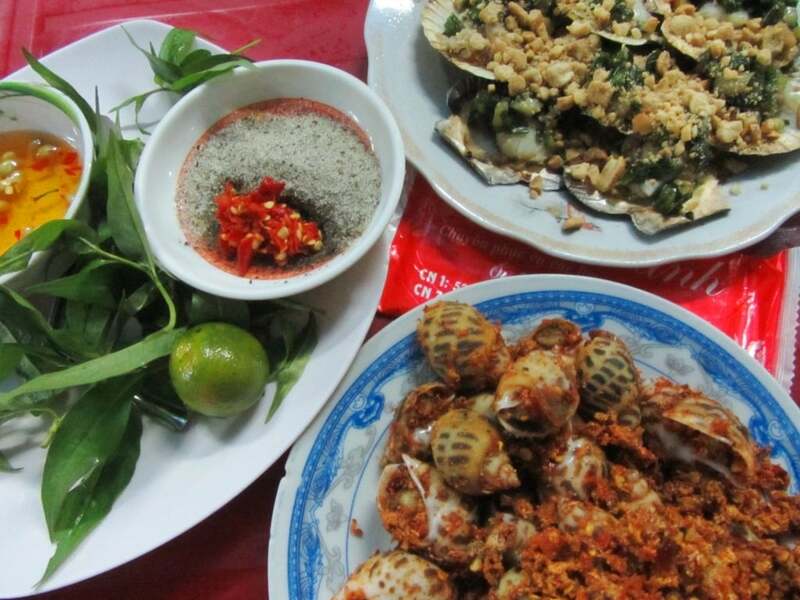 Try the ốc hương ràn muối ớt (fried sea snails with salt and chilli) and the sò điệp nướng mỡ hành (grilled scallops with spring onions and peanuts). Prices are a little higher here than elsewhere but it’s worth it. Be prepared to wait a few minutes for a table, and don’t be shy to shout over the din when it comes to ordering. 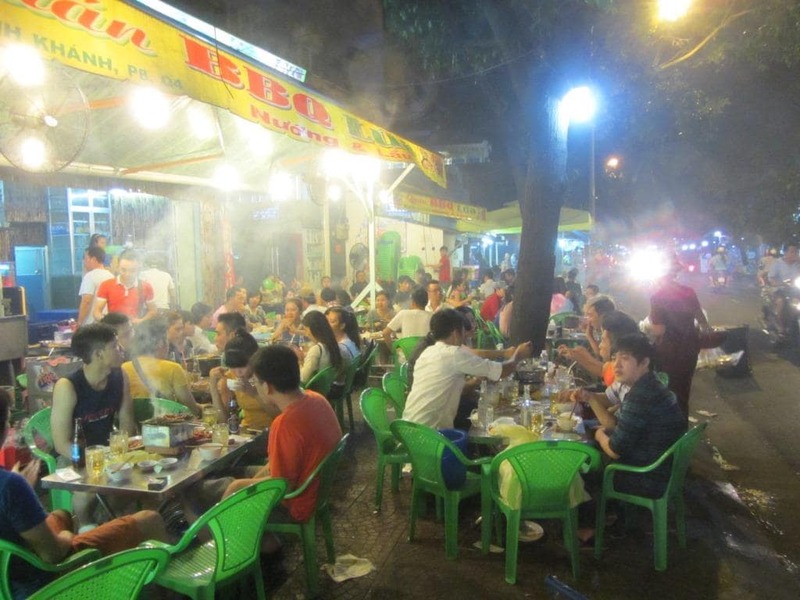 Near the intersection with Hoàng Diệu Street is Quán BBQ Lúa (33 Vĩnh Khánh Street). The speciality here is grill-it-yourself barbecued meat. A small coal-fired stove is placed on your table onto which you lay chunks of marinated beef, pork, goat and fish. The sườn heo ngũ vị (pork ribs in five spice marinade) is delicious. A long, narrow street connecting two of Saigon’s biggest arteries, Phan Văn Hân Street is lined with cheap food stalls frequented by locals and students from nearby universities. Just across the Thị Nghè Channel from the glitz and glamour of Saigon’s central District 1, Phan Văn Hân Street has a very local, unpretentious atmosphere. The street is densely packed with food vendors, shops, homes, businesses and motorbikes, creating an intimate environment where space (which is in short supply) is often shared. 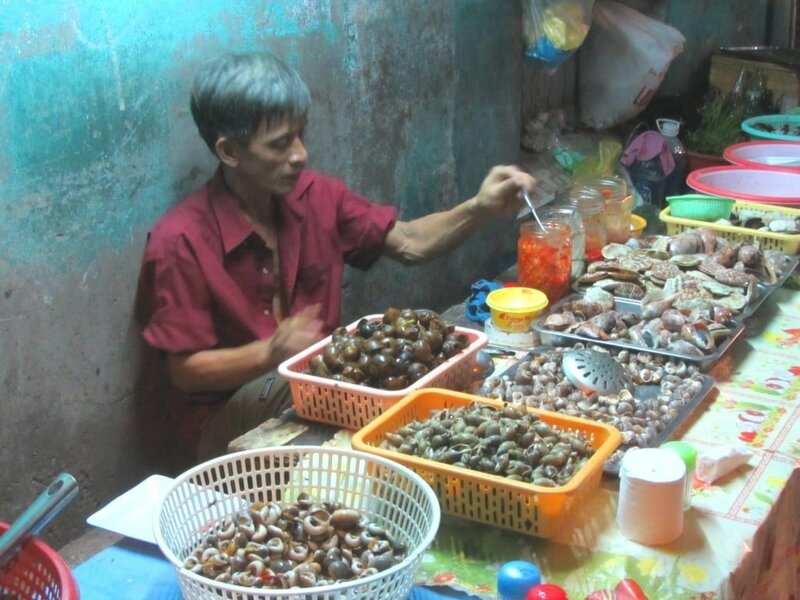 Snail and shellfish eateries – lit by naked fluorescent light bulbs – set up on the pavement next to the peeling plaster of old homes; bánh xèo stalls occupy local people’s doorsteps; soup vendors serve customers at tiny tables on a slither of sidewalk not more than a few feet wide. The scented smoke from all these food vendors drifts into the street, where their aromas mingle with the exhaust fumes from passing traffic. This is a very lively little neighbourhood where all the classic Vietnamese street food dishes are well-represented. Come between 6.00-8.30pm to experience it at its busiest. Bột chiên (fried rice flour cubes that I like to call ‘Vietnamese French fries’) is a street food staple: find it at the corner of Phan Văn Hân and Xô Viết Nghẹ Tĩnh streets. The vendor here has been serving bột chiện for 20 years and has gotten pretty darn good at it. One of the most famous noodle joints in the area Lương Ký Mì Gia (1 Huỳnh Mẫn Đạt Street) is right at the eastern extreme of Phan Văn Hân Street. They sell all sorts of noodles but the dish that made them famous is mì vịt tiềm (fresh yellow noodles with marintated aromatic duck) – get here early because they run out of this dish fast. Cô Giang is a long, straight street that unofficially marks the southern perimeter of Saigon’s burgeoning backpacker area in District 1. 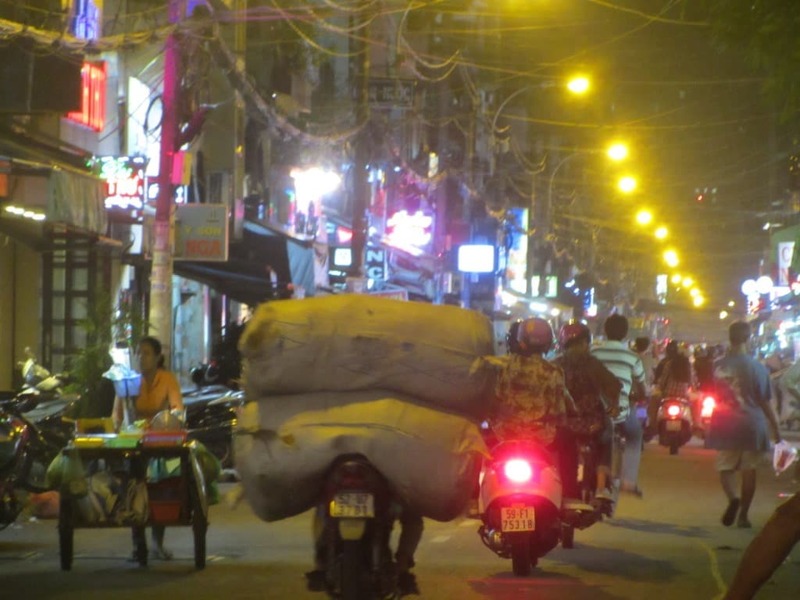 However, Cô Giang Street is a lot quieter than Phạm Ngũ Lão, Bùi Viện and Đề Thám streets whose bars, western restaurants and mini-marts make up the centre of the backpacker district. In general, travellers who choose to stay or spend time on Cô Giang Street are looking to get something more ‘authentic’, more ‘Vietnamese’ from their time in Saigon. While Cô Giang is not as densely packed with food stalls as other streets in this guide, it still offers plenty of local street-life and bustling open-air eateries, especially around the intersection of Cô Giang and Đề Thám streets. In the evenings bright fluorescent light bulbs illuminate streetside barbeques, whooshing woks, and bubbling cauldrons. Scented cooking smoke fills the air and hangs, like a Dickensian fog, over the diners sitting at tables on the sidewalk. 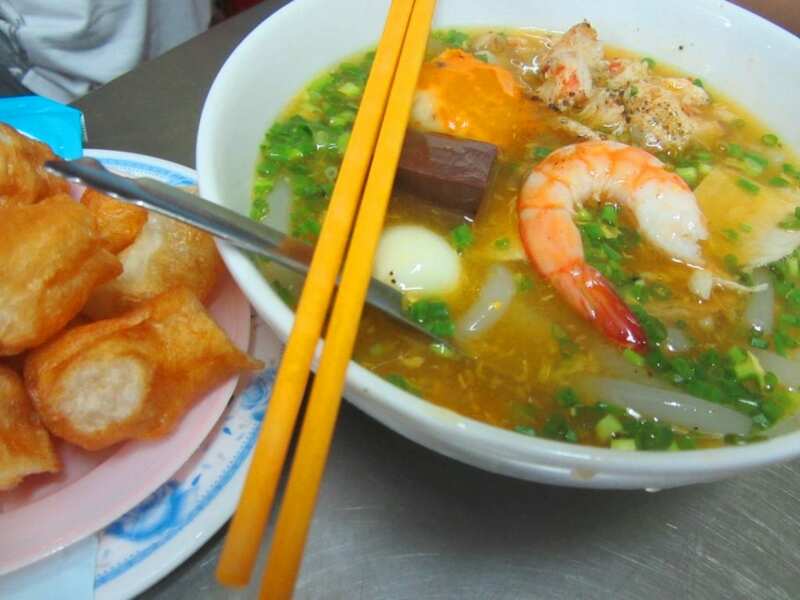 Right on the corner of Cô Giang and Đề Thám streets there’s a cluster of hugely popular outdoor restaurants, specializing in thick Chinese-style fried noodles called hủ tiếu xào. Quán 79 is particularly good for this dish and there are plenty of other items on the menu here – most of which have been translated into inadvertently hilarious English, thanks, I suspect, to Google Translate: ‘vegetable of transcendent garlic’ was one of my favourites. 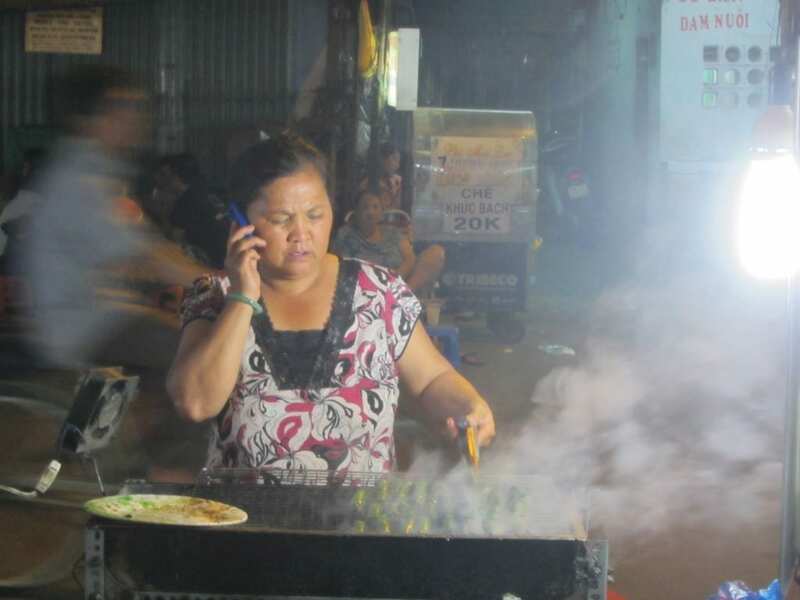 Don’t miss the stalls selling bò lá lốt (grilled beef rolled in aromtic betel leaf); they’re easy to find because of the smoking barbecues out front and the enticing smell. The bò lá lốt at Hoàng Yến (121 Cô Giang Street) is superb and very cheap too (20,000VNĐ per portion). A chaotic jumble of motorbikes, cars, pedestrians, food vendors, and diners on the sidewalks devouring their dinners, Tran Khac Chan Street is a throbbing street food mecca. In the space of a couple hundred metres there are close to 50 food outlets, all vying for space and attention on this busy little street. Hemmed in at one end by the Thi Nghe Channel and at the other by the tree-lined Tran Quang Khai Street, this is a place to really let your ‘foodie instincts’ guide you: follow the smells, the smoke, the neon signage and, most importantly, local people, towards anything edible that takes your fancy. I think of this street as an open ‘wardrobe’ of food in which I’m free to try anything on. Most of the action is at the Thi Nghe Channel end of the street. A good place to start is at the popular Banh Canh Cua 87 which, predictably, serves bánh canh cua at number 87 Tran Khac Chan. This gooey, slimy, crab-based concoction, uses thick and doughy noodles which are famously slippery: getting them to stay on your chopsticks from bowl to mouth is a challenge. There are a couple of enticing ‘grilled meat trolleys’ plying this street: the smell of barbecued chicken is difficult to pass up. Saigon nights can be hot and humid; cool off with a glass of freshly squeezed pomelo juice (nước ép bưởi) at 114 Tran Khac Chan. At the corner of Tran Khac Chan and Tran Khanh Du is Banh Xeo 79 where the cook, who claims to be shy, strikes eccentric poses in front of the camera. Lined with enormous concrete electricity pylons, Nguyen Thuong Hien is a straight and narrow street leading northeast from District 1. Yellow street lamps poke up above the squat, boxy houses, and tangled electricity cables hang in front of neon signage like jungle vines. At night, there’s a sense of Dionysian abandon on this street: hundreds of diners take their seats at sidewalk restaurants, munching on shellfish, throwing empty beer cans under their tables, talking loudly, and singing along to acoustic guitars. There’s a lot to eat and drink on Nguyen Thuong Hien, and a lot of fun to be had. The liveliest section of Nguyen Thuong Hien is between the cross streets of Nguyen Dinh Chieu and Vo Van Tan. Settle down to some snails and shellfish – a classic Saigon night out – at A Soi (237-239 Nguyen Thuong Hien). Oysters, clams, crab claws, sea snails and local beer are all on the menu here. Although Nguyen Thuong Hien is famous for its seafood, it’s also become the unofficial fruit juice street of Saigon. Near the intersection with Nguyen Dinh Chieu and with Nguyen Thi Minh Khai there are several large ‘juiceries’ where all number of tropical fruits are freshly squeezed into plastic bottles to take away (try Phat Dat at 125 Nguyen Thuong Hien). In the past, you could have headed to Nhân Quán for a bowl of its famous hủ tiếu Nam Vang noodles (slices of pork, whole shrimp and quail eggs in a clear sweet broth seasoned with shallots, spring onions and kale). However, they have recently moved location to 488 Nguyen Thi Minh Khai Street, which is a 5-10 walk west of Nguyen Thuong Hien – but it’s worth the walk. 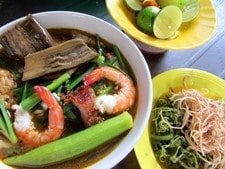 This entry was posted in ALL, FOOD & DRINK, Resources, Saigon, Street Food, The South and tagged best, blog, guide, Ho Chi Minh City, Saigon, street food, travel, Vietnam, where to eat. Bookmark the permalink. Brilliant article Tom, and thank you so much for posting it. It is incredibly difficult to get a summary of where to find the real deal when it comes to street food. So much of what we read about has inevitably become very much part of the well worn path, but you have managed to accurately report on some terrific food locations. We took your advice and hit Vinh Khanh Street big time tonight and had a great chow down at Hoa Don Ban Le (excuse the lack of Vietnamese accents). 3 of us hoed into tamarind crab, bbq giant scallops, clams, bbq chicken feet, etc etc. A real feast with a beer and change from $25. Thanks. It’s really good to hear that you enjoyed your feast on Vinh Khanh Street – it makes me hungry just to hear about it. I hope you find more good food during the rest of your trip to Vietnam. It can sometimes be difficult being a vegetarian eating street food in Vietnam. You can look out for signs saying ‘cơm chay’ (vegetarian food) – you’ll see quite a lot of places like this in big towns. And try to remember this phrase, ‘tôi ăn chay’ (I’m a vegetarian), which you can say before ordering a dish so that people know you don’t eat meat or fish. I can’t think of any specific street food dishes at the moment that are vegetarian – when I’m with vegetarian friends I usually just order meat dishes without the meat: for example, bánh xèo (the savoury pancakes featured in some of the pictures on this page) không thịt (không thịt means ‘without meat’). Hi Tom! I love your website! Your writing is amazing and your documentation is so thorough and helpful. I was in Saigon for a month last summer and am coming again in August of 2018. As a vegetarian, I found there is a lot of food available for me, but I have a specific question for you if you know. Do you know which of these streets has the best options for vegetarian food? I’m pretty flexible, I’ll eat meat broth, fish sauce, etc but no actual flesh. I know this is probably too specific a question for a carnivore, but any info you have would be great! Thank you so much! Probably Su Van Hanh and Co Giang streets will have the most vegetarian options out of these 7 streets, because there are some Buddhist temples nearby. The word to look for is ‘cơm chay’ which means ‘vegetarian food’ in Vietnamese. 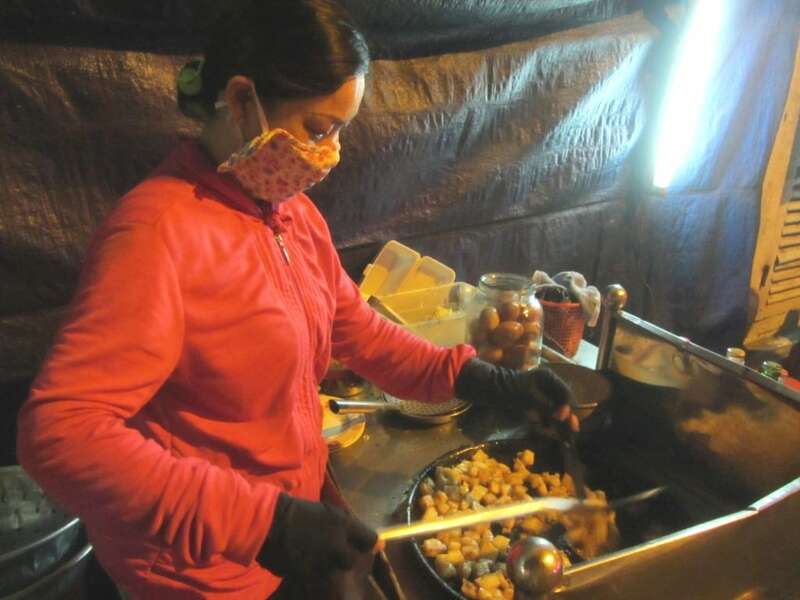 Also, many people don’t eat meat on the new and full moons in Vietnam, so you’re much more likely to find vegetarian food all over the country on those days. That is really helpful, thank you so much! I appreciate the info. Do you know if cakes/pastries in French style (like madeleines and croissants) are sold on the street in Ho Chi Minh City? Thanks to you we had the most amazing evening on Nguyen Thuong Hien Street last night – crab in tamarind sauce, barbequed oysters with roasted peanuts and lemongrass clams were among our favourites. You made our stay in Saigon so much better than it would have been – we had amazing sushi in a back street, visited the Cafe Apartment and had cocktails served in a pirate ship at Shri Bar. A few beers down the line last night we decided we would only do things recommended by you. But we arrived in Hoi An this afternoon and aside from the article on the Lantern Festival you’ve left us high and dry! 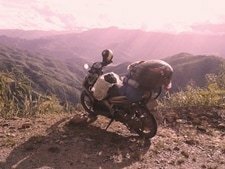 Do you have any recommendations for anything off the beaten track? We’d really appreciate your help! Great to hear that you enjoyed Nguyen Thoung Hien Street and the rest of Saigon. As much as I love walking around the old town, it’s difficult to get away from the tourist area: where do ‘real’ Hoi An residents eat, drink, play? I usually stray a couple blocks further out, looking for signs (not in English) for various regional dishes – cao lau, mi quang, banh xeo, banh beo – and then eating at any one of them that looks, feels, and smells good and is packed with local Vietnamese (not tourist Vietnamese). Hi Tom, am in Hoi An, I have found a good way to spot a locals restaurant is the chairs – big chairs, westernised food, little chairs authentic food. Yesterday the place we found had no English on the menu, but clucking sounds will get you chicken of some kind, yesterday awesome fried chicken, today Sun Ga, bit too chewy for me, tomorrow I’m going to make moo sounds and see what the beef is like. I hope you find some good ‘moo’ tomorrow. Thanks for the write-ups… ill be there in January! I loved the Thai street food and hope to find some great food in HCM too!!! Thanks again. Thanks. Happy to hear you’re enjoying my site. And congratulations on winning a trip to Vietnam! 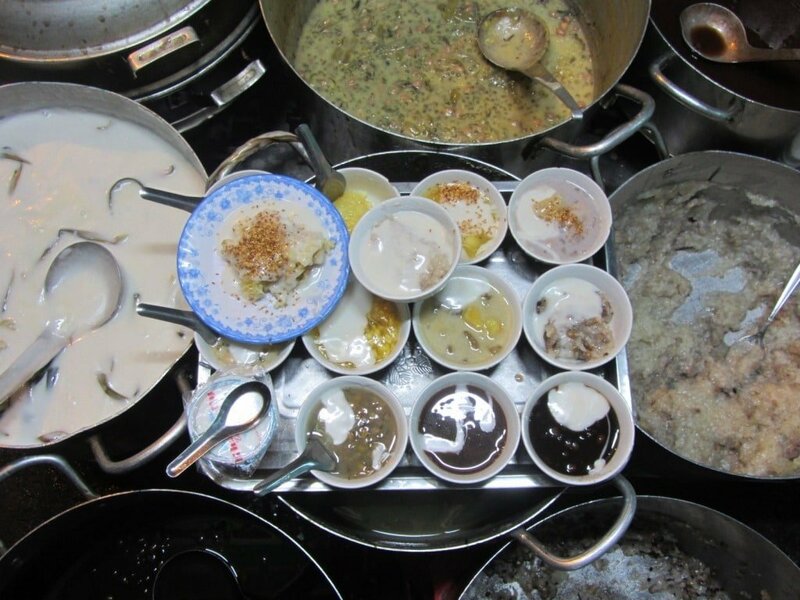 I’m sure you’ll have a lot of fun delving into Vietnam’s food scene – there’s so much of it to discover. I’m haven’t written much about food in Hoi An yet; the only Hoi An post I have is about the Lantern Festival here. 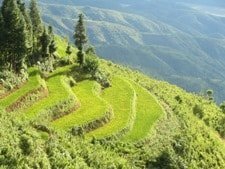 My wife and I, vibrant but not 30ish, are planning a 7-10 trip to Vietnam in February originating in New Zealand where we have a home. Our focus is food and eating the local specialties in situ. Your blog is fascinating and I wonder if you can organize a tour, with that focus, for us. Our dates are flexible. I’m afraid I don’t run any tours (yet). 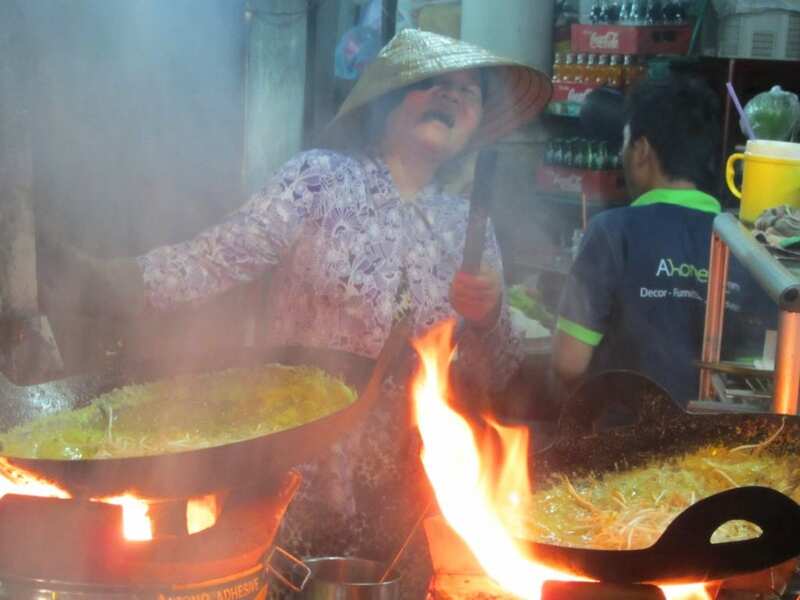 However, there are some excellent street food tours available in Saigon and in Hanoi. Have a look at XO Tours and Back of the Bike Tours for Saigon, and Sticky Rice Tours for Hanoi. Thanks. Already salivating after reading the piece on street food. Do you know until what time these streets are open? We’ll be arriving past midnight and wishing to drop by to some of the streets before going to Phnom Penh. And is there a nice coffee shop would you also like to recommend? very busy at that time of night. some local coffee shops open on these streets. Great that you’re working your way through the food streets. That’s a shame about the banh xeo place on Su Van Hanh – but that whole ‘ghetto’ area is being demolished so things are changing quickly there. We had the normal communication issues and ended up eating three courses – glazed ribs, grilled pork, and then managed out the dish we were after (as recommended by you!) what a cracker! Might make it on to Anna’s menu I reckon. 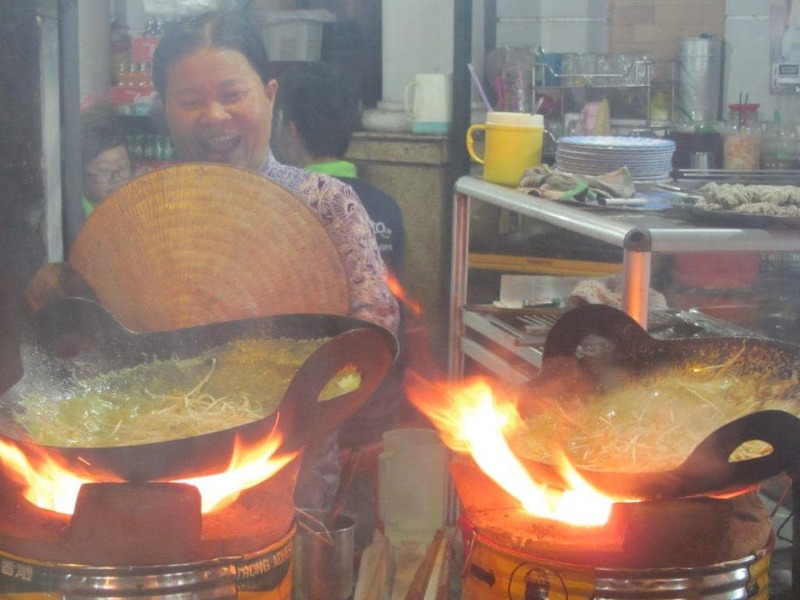 Brilliant blog on some of the best street food areas in Saigon. Will be visiting some of those very soon! I hope you enjoy the food while you’re in Vietnam. Hi Tom, thank you for the tip for an bbq octopus at Van Kiep street! Best one I’ve ever had. The eatery was crowded, so it’s defintely a very popular place. Yes, that place is usually packed with young Vietnamese – all loving the octopus! Hi Tom!! So glad I happened to stumble on your blog. I came upon it researching the lunch lady was totally impressed you rated and documented her weakly menu. 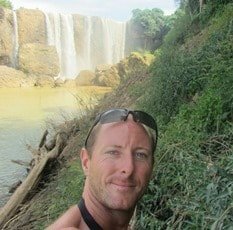 Your blog is so informative and I will be heading back to Vietnam–my third trip in three years!! The people, food and land keep calling us back. Last time we stayed in Saigon it was in District one near Ben Thanh market. We are spending more time in Saigon this year–about 4.5 days. Is there a certain hotel you would recommend for great street food within walking distance? We will be going to DaLat so I was glad you posted all the great eats DaLat has to offer. Also I know you broke the beaches down in Phu Quoc but was there a certain accommodation you recommend? We were thinking about Ong Lang, Ganh Dau or Vung Vau Bay. Would these places be too far from local restaurants? 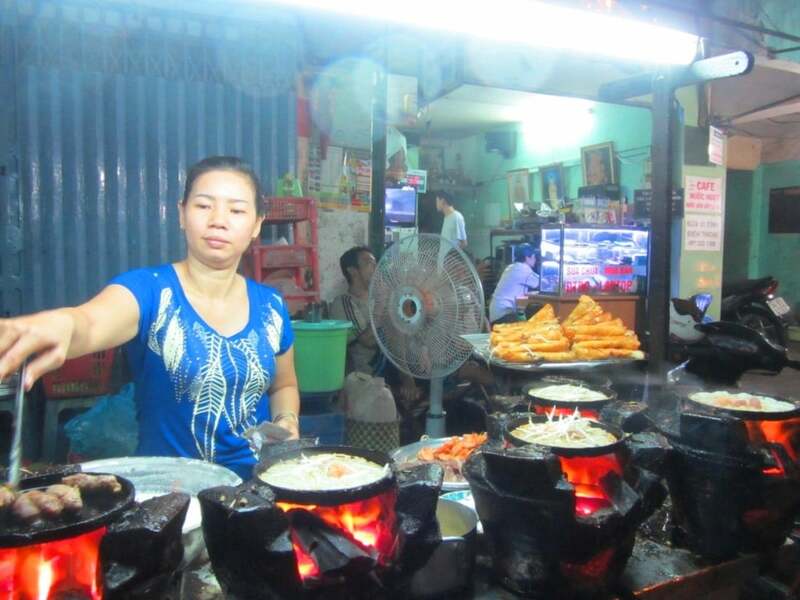 The best or ‘real’ street food in Saigon is found out of the downtown area of District 1. You could stay in one of the guesthouse on Co Giang (which is one of the streets listed on this page). Miss Loi’s is a famous guesthouse on this street. Alternatively, stay in a hotel on the other side of the Ben Thanh roundabout from the market. There are mid-range hotels around the Fine Arts Museum. There’s a fair amount of street food is that area, and it’s not too much of a walk to Co Giang Street. Also not too far away from there is Vinh Khanh (another street listed on this page) – it’s just over the bridge in District 4. To really get into ‘street food land’ try Ma Maison Boutique Hotel. This is away from the city centre in a busy local area. There’s loads of street food on and around Bac Hai Street nearby. 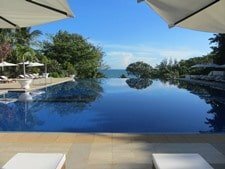 On for Phu Quoc Island take a look at my Driving to Phu Quoc article – in it I list a couple of good accommodations on each of the beaches you mention. Of the ones your interested in Ong Lang is the nearest to Duong Dong town which is the only place that has any number of local restaurants and street food on the island. It’s a 10-15 ride taxi ride away. We booked a few nights already in Saigon at Anpha hotel which overlooks Ben Thanh. We will be within walking distance to The Fine Arts Museum and Co Giang and maybe Vinh Kanh. So we will definitely check out the street food there. Maybe on our last day we’ll book a night at Mai Mason to get out of district one. Thanks do much for all your suggestions. Are any of the food vendors inside Ben Thanh even worth a look? We decided to can it to all the other street you suggested! In Phu Quoc we decided to split our time between Duong Dong–Phuong Binh house and then all the way north at Peppercorn for a few nights. Thanks again for all your informative posts!! Sounds great. The cooked food stalls inside Ben Thanh Market are good, yes. But, again, you get these inside all the other big local market that I’ve listed in my Best Markets Guide. Peppercorn is lovely and isolated. I hope you have a good time there. 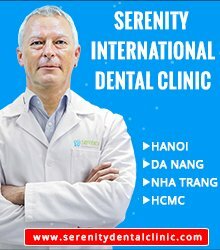 We recently returned from a 25-day holiday to Vietnam and I would like to thank you for all of the wonderful suggestions and advice you provide freely on your website. We stayed in an apartment in D4 and had an amazing time with our young family, including three children aged 7 and under. We didn’t see any other Western tourists, just a few expats and the local people were exceptionally friendly and kind. Too many examples to mention. Yes, we ate a lot on Vinh Khanh Street and my 7 year old son just loved the fried sea snails with salt and chili at Oc Oanh’s, eating a whole plate to himself using a safety pin! Thanks for your post about the best swimming pools in HCMC as well. We took the advice of one of your subscribers, Phillip, and swum in the pool near us in D4 and it was great… lots of fun had with the local kids and the water quality was excellent. Happy to hear you and your family had such a good time in Vietnam. I will have to try that pool in District 4 soon. I hope you’ll get the chance to visit again someday. I forgot to mention Tom that your commentary about the D4 market, on the street behind our apartment block where we stayed, was spot on. We saw many markets on our travels in Vietnam and the D4 market was very authentic, absent of all Western tourist influence. It was fun buying fruit, baguettes, beer and vegetables every day, communicating with local vendors as best we could. Observing the local dealings going on there, it got rather testy at times! Thanks for the coffee suggestion. I’ll find it next time I visit Dalat. If you like that kind of cafe you should also visit Café Năm at 13 Phan Bội Châu Street – it’s a classic old cafe run by a lovely old woman – you can find out more about it in my ‘Where to Eat & Drink in Dalat’ article. Thank you so much for your efforts. I am heading back to HCMC for my 4th visit in a day or so and will try each of your street food tips. I have found the food around D1 generally good, but reading your blog, I realise I have been missing the real VN tatse experience. Yes, the food is still pretty good in District 1 but there’s a lot more to discover in the surrounding districts. Have fun street food hopping on your next visit. Nice write up. I love your interesting yet informative articles. I will surely go exploring afew of these streets in the next few weeks. Thanks! Hope you have fun eating and wandering these streets.